Alessi also remains committed to a design approach that collectively brings together artistic expression and industry; they collaborate with various artists and designers from all over the world to create a huge range of iconic, whimsical pieces that belong in both a design museum and your home! Designed by Italian architect and designer, Stefano Giovannoni, the Ethno Round Tray is a sinuous and complex additional to any contemporary dining table. If you gaze at this unique round mat in the light, and allow the shapes and space to play, you’ll be confronted with a circle of stylised human figures. Each shape is cut out of the bright stainless steel, and holds hands in an eternal dance around the edge of the eye-catching piece. Designed in Italy by Stefano Giovannoni. Made from 18/10 stainless steel, polished to a bright, mirror finish. Round Mat is decorated with a circle of stylised humans, who appear to be joining hands in an eternal dance. 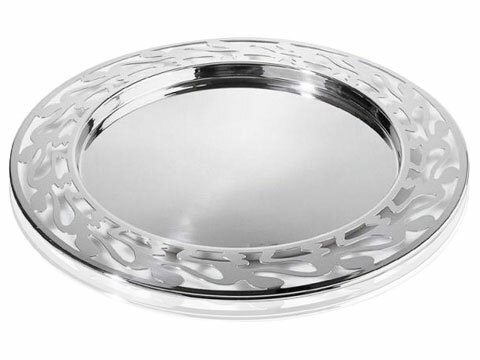 Can be used as a serving plate, or as a decorative piece.